Other than a few small areas that need tidying, I am finally done using the awful tool in the photo above. 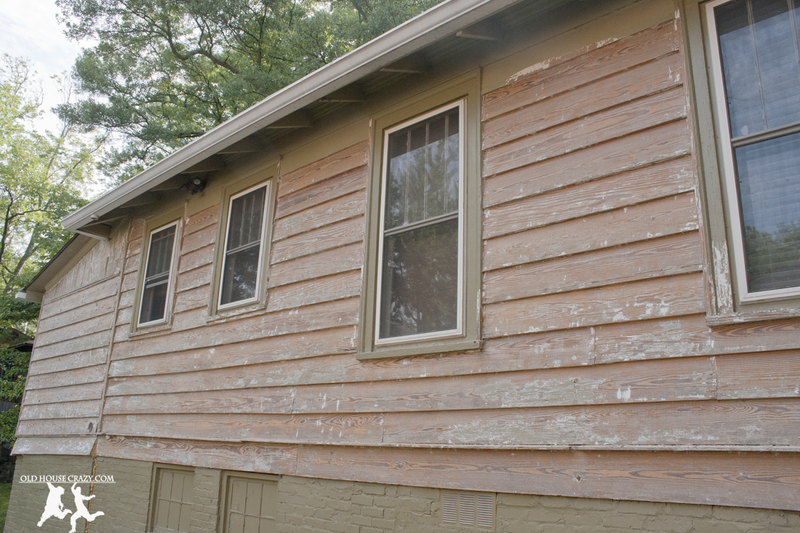 It’s been a long run: three summer vacations spent manually tearing away layer after layer of angry old paint from the heart pine siding of our crazy old house. 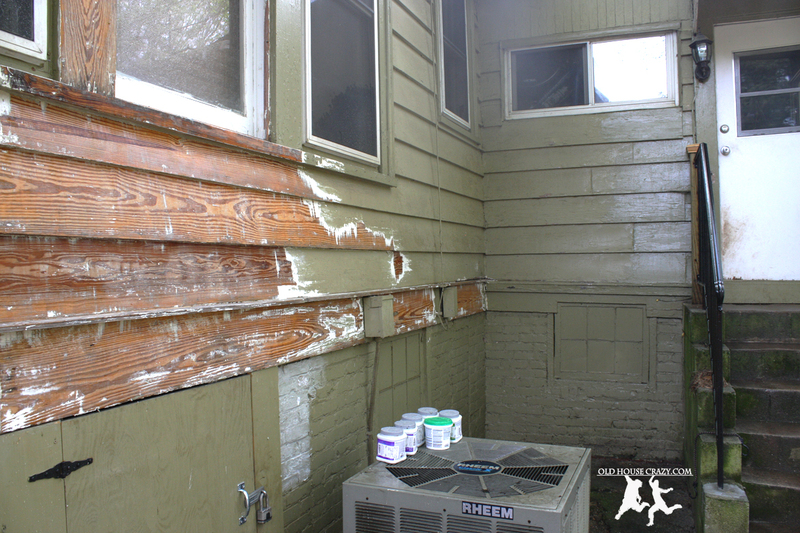 Next, we’ve got to finish the prep work, which includes caulking, patching with wood putty, and sanding imperfections. After that comes the paint. 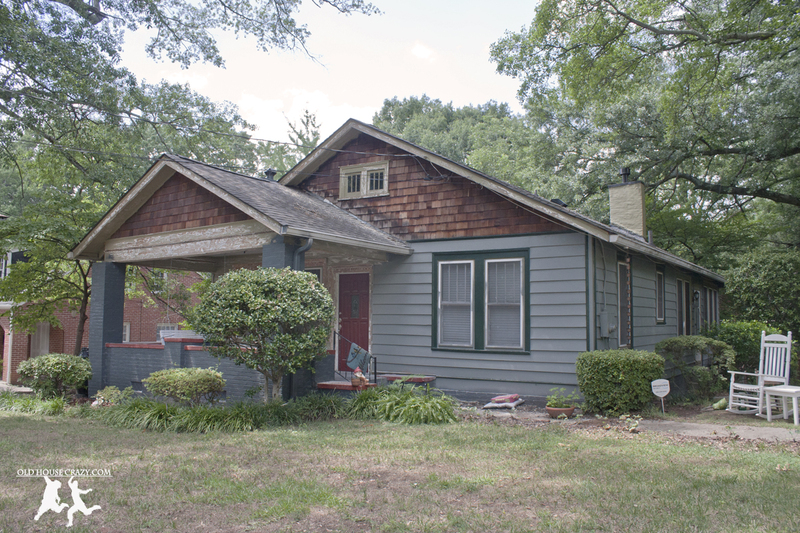 I’ve found that for this exterior paint job, we spent probably 95% of our time prepping before we spent 5% of our time painting. 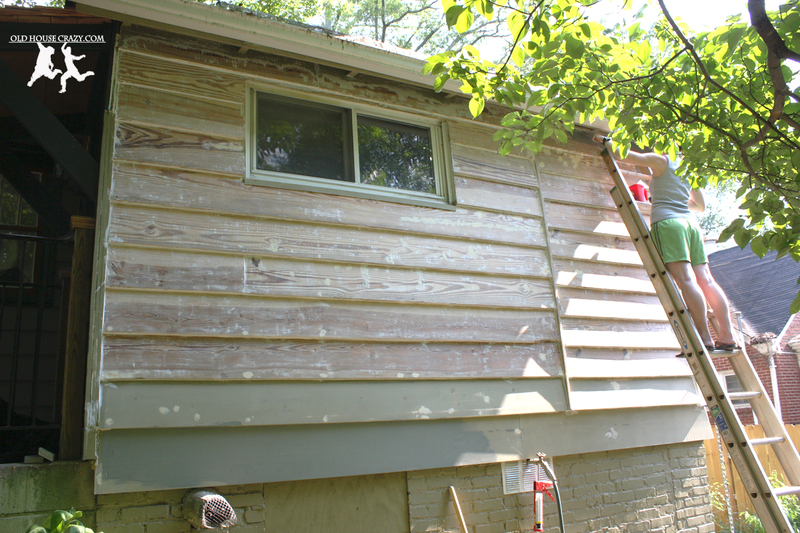 If you like to paint, but don’t think you’d like the prep work, pay someone to paint your house. 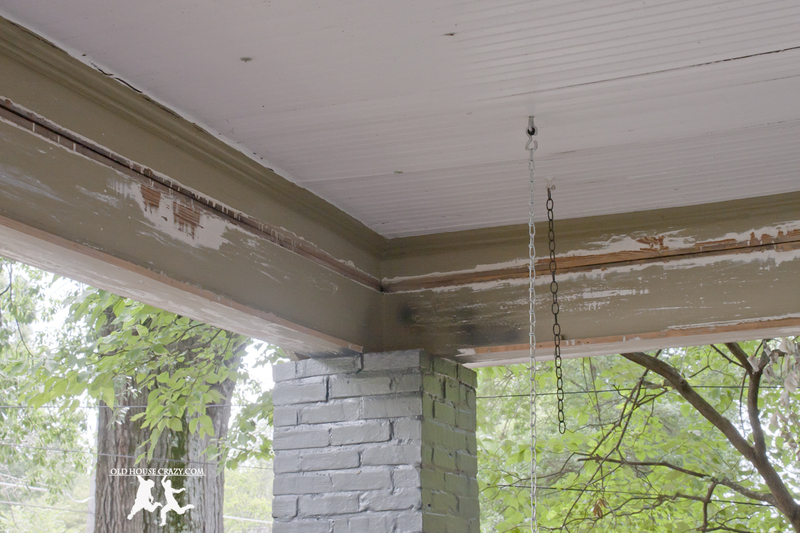 The rest of this post is a photographic tour of the scraping process around our house over the last three summers. 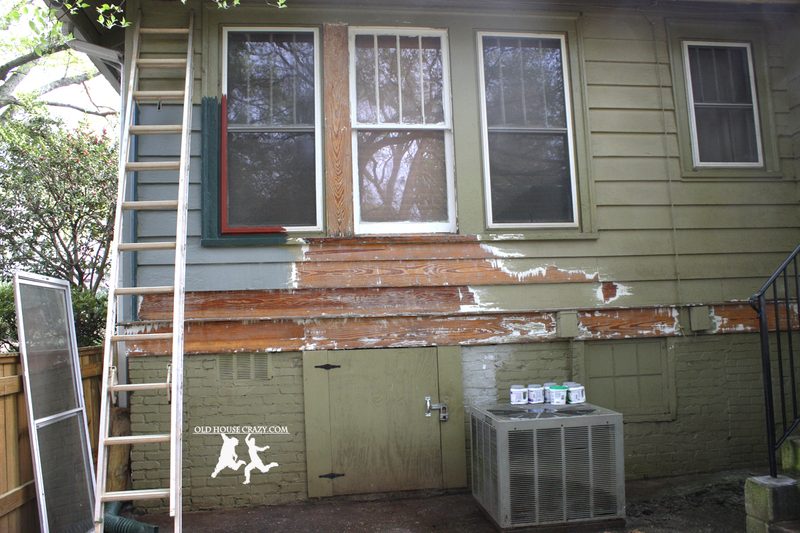 You’ll see where we completed other surprise jobs that we only discovered we needed when we ripped back the paint. 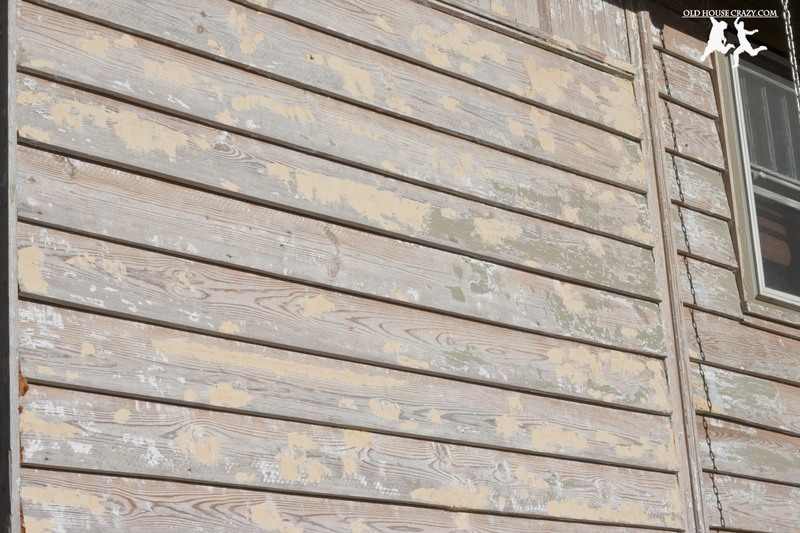 Note: paint is really good at covering rotting boards and termite damage. 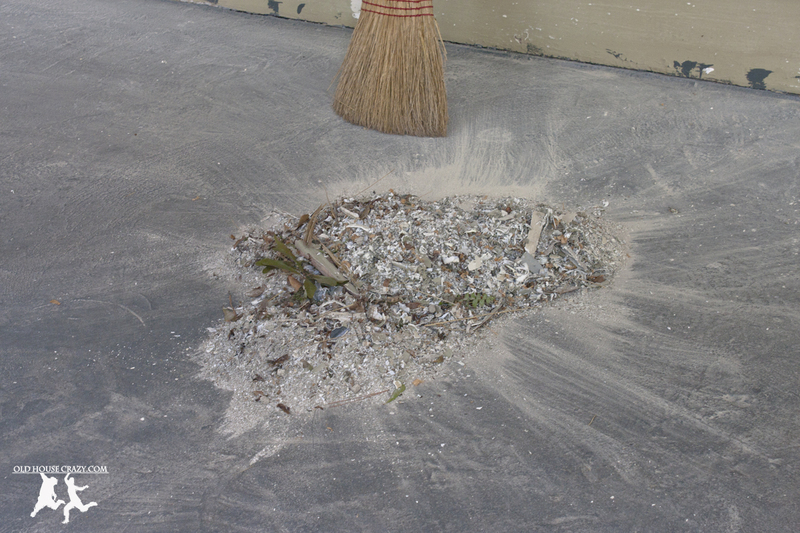 The first photo shows how much scraping I finished during my first spring break spent scraping. 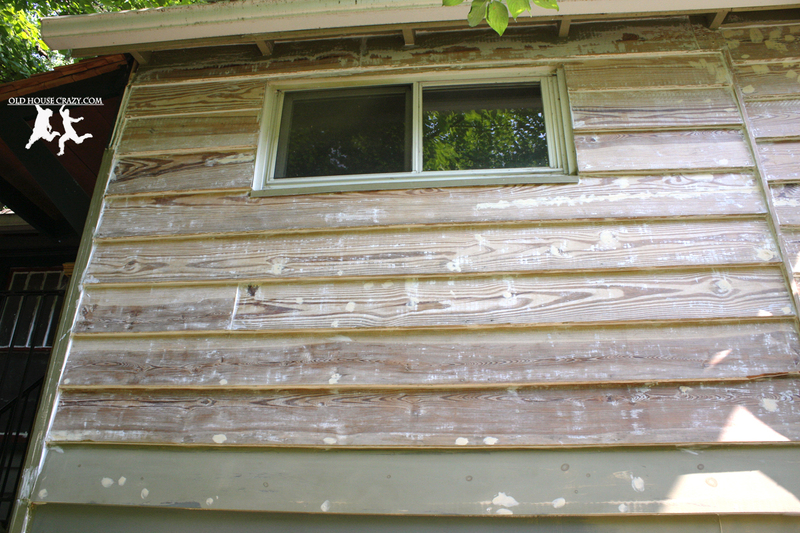 I foolishly thought I’d be able to scrape and paint my whole house during that week-long vacation. It’s seven whole days, right? You can also see where we tested out our paint colors on the left side. Another view of week 1 of scraping. Since then, we’ve had our HVAC replaced and the new unit is on the other side of the house. We still can’t figure our why you’d put a noisy compressor on your patio. When we bought the place, the back door was covered by one of those hideous aluminum awnings that people put up in the 50’s. Gross. We took that down and I built us a new one out of cedar. We also had wrought iron rails put up on the stairs to replace the iron piping that had been there. On the triangular section above the windows, we put up cedar shingles to compliment the ones on the front of the house. They also match the shingles on top of the new door awning and the cedar stain we use on our fence. Moving around to the laundry room. This used to be a sleeper porch, but was at some point converted into a new room. 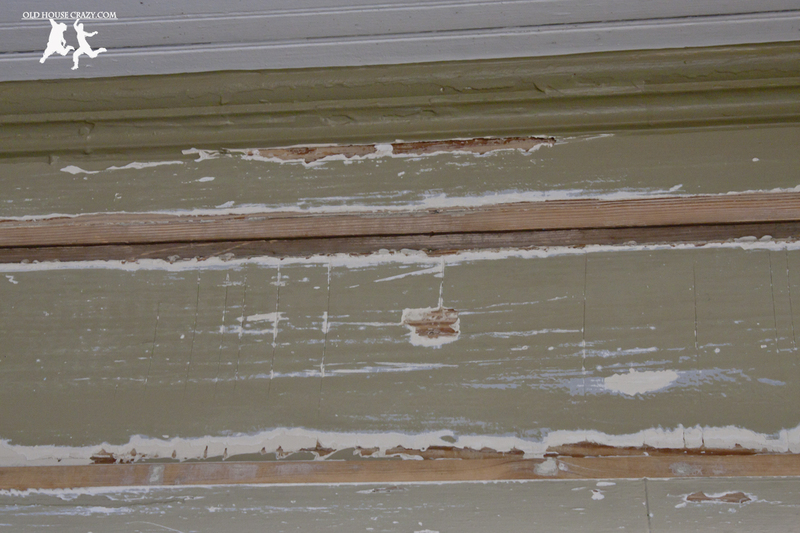 Here it is scraped, puttied, caulked, and sanded. Christy is starting to paint in this photo. 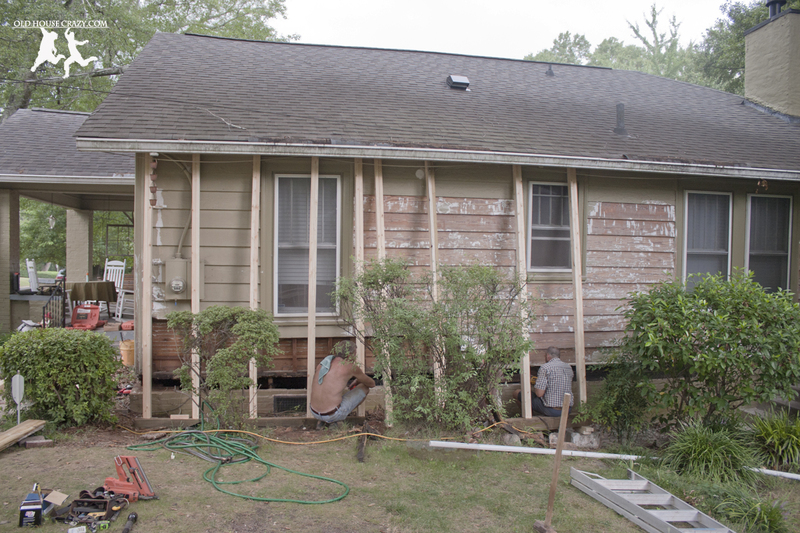 The bottom two boards had to be replaced when we bought the house because they were rotting. We also had the seller put up the gutter you see in the photo. Why replace the boards if you don’t fix the cause of their rotting? Here’s the far side of the house, fully scraped. You can see that I didn’t scrape the top two boards. 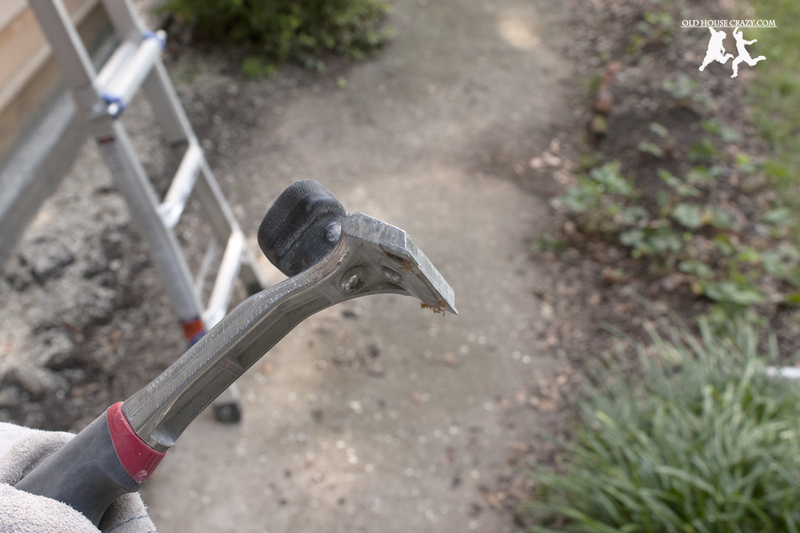 That high up, it’s difficult to get the proper leverage with the hand scraper. Back side, puttied and sanded. Last summer, the fun really started. While scraping the driveway side, I discovered that our sill plate on the front corner of the house had been eaten away by a pretty large termite infestation many years ago. It had been puttied over and painted so you couldn’t see it until the paint was removed. 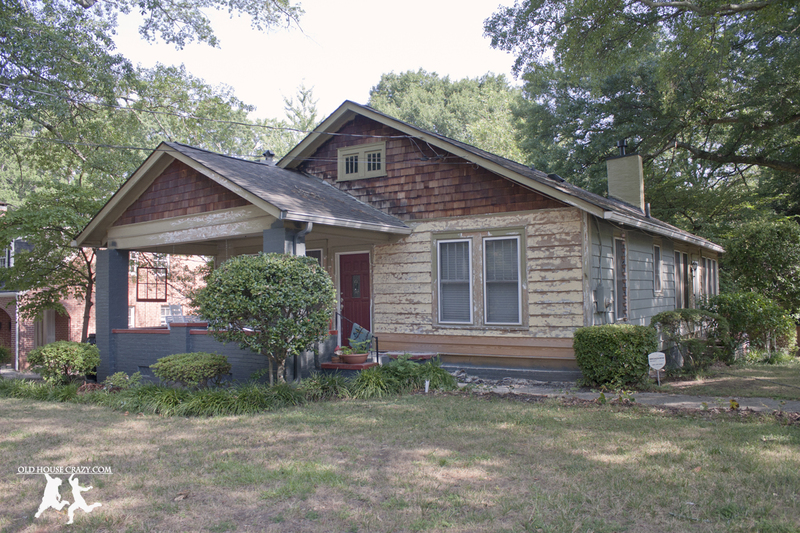 If you’re buying a house, do a really good termite inspection. You might not find damage like this, but then again, you might. 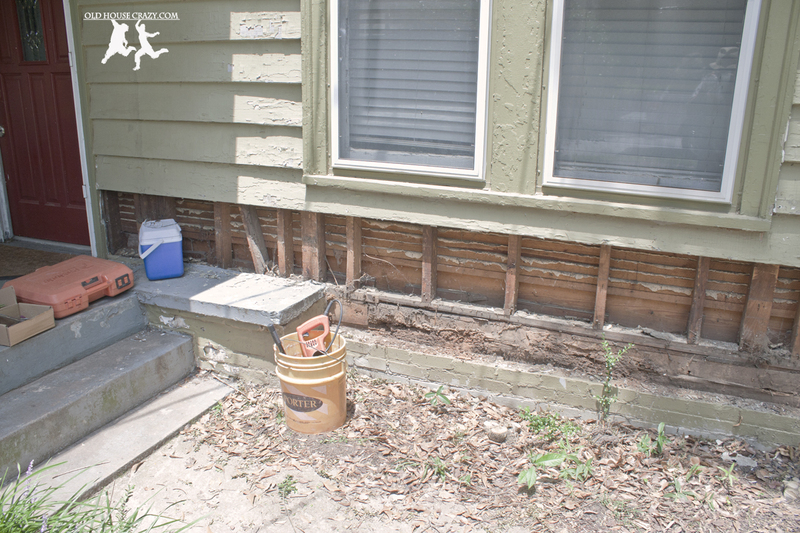 The whole front corner of the house had sunk about 5 inches because of the loss of structural integrity in the sill plate. This was a big job. Replacing the sill plate, driveway side. The rest of the photos are much more recent. 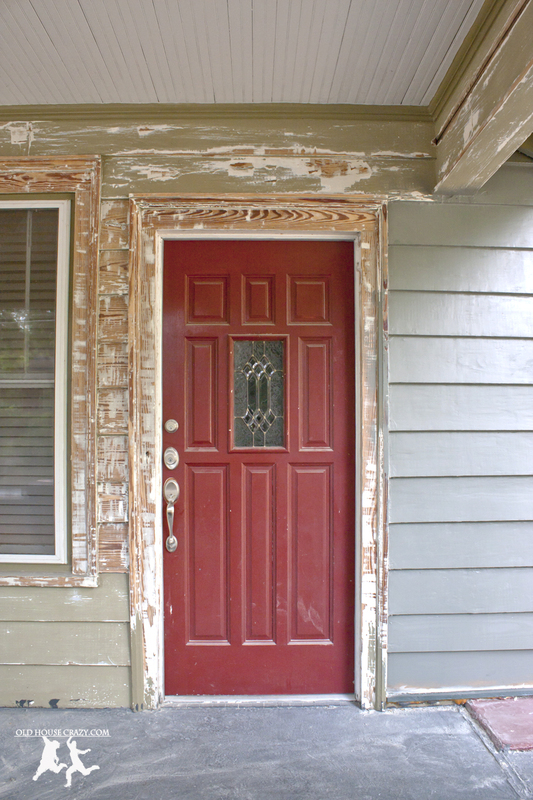 Here’s the front of the house, scraped and puttied. You can see that we’ve already painted the foundation in this photo. 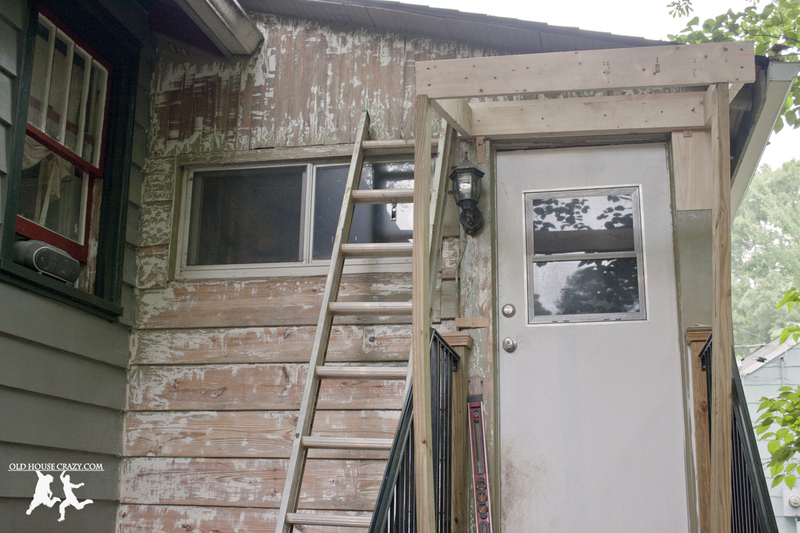 You can also see the new siding boards that I put up when the sill was replaced last summer. Here’s a pile of paint scrapings and dust. Loads of fun. Wear a mask, y’all. 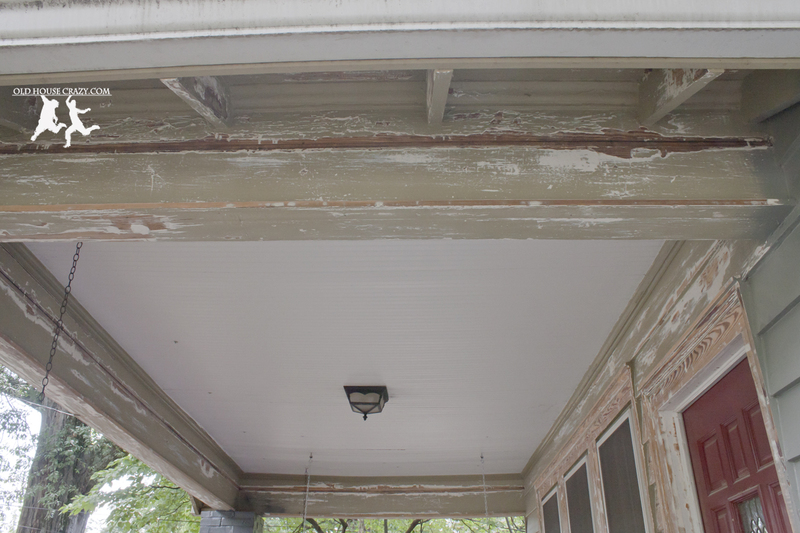 I didn’t scrape all of the paint off of the siding under the porch. This paint was still in pretty good condition, so I scraped the bad stuff and patched the imperfections. Door frame. I took down the old doorbell. We’re going to put up a servant’s bell some time in the future. We took down the old moulding and are going to replace it with new stuff. Most moulding actually serves a purpose. This moulding covers a crack between two boards. Under the eaves on the front porch. You can see here that we’ve already painted the front of the office and some of the trim. 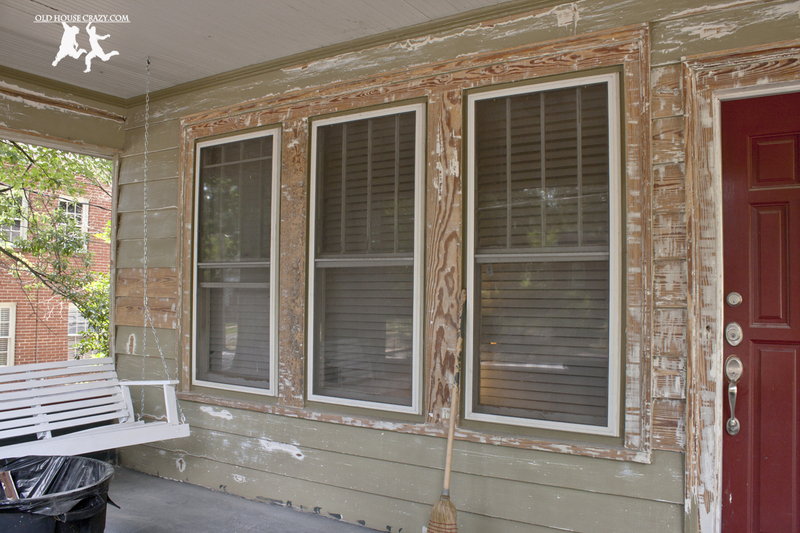 In this photo, the exterior trim up to the pinnacle of the house is also scraped and ready for paint. 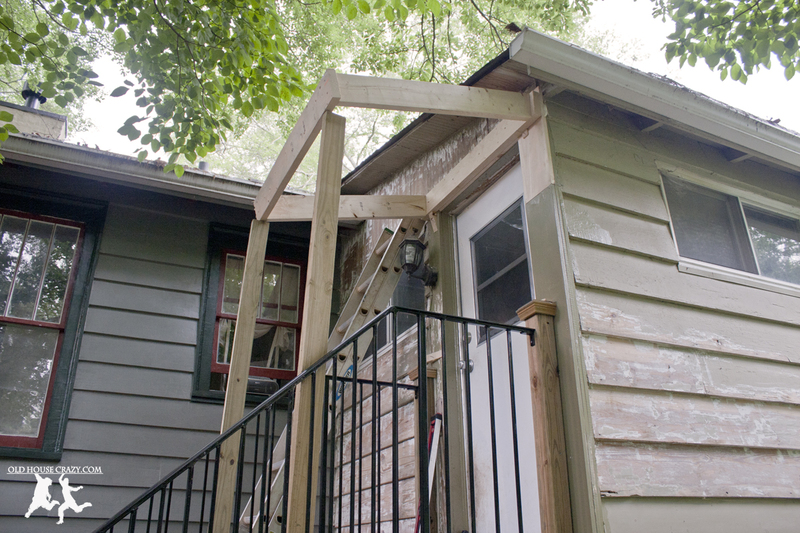 Here’s a closer shot of the front porch, ready for paint. I really can’t express to you my excitement at finishing the scraping job. It’s been looming over my head for the last three years. If I had any free time, I had this major job that needed doing. Now, that doesn’t mean I spent every spare minute working on this job. I probably could have finished in less than one year if this was all I’d worked on. However, that’s not what happened. 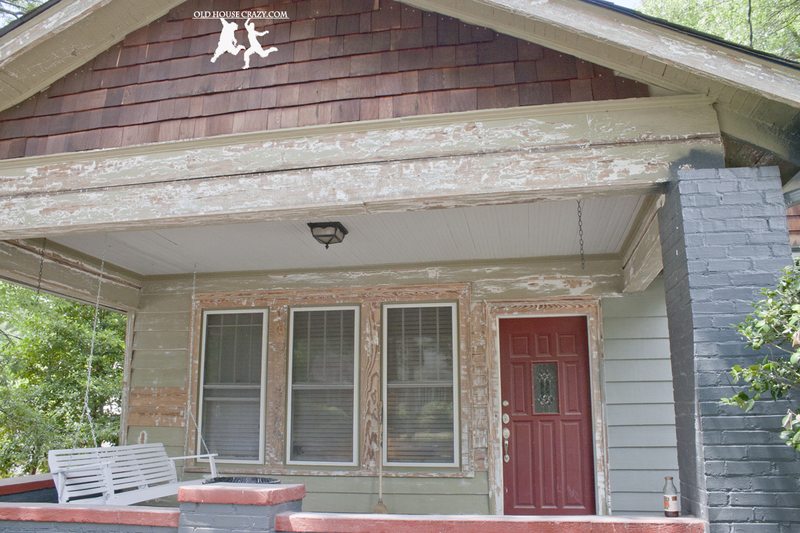 This entry was posted in DIY, Don't Hire a Professional, Exterior Maintenance, Front Porch, Heart Pine, Painting and tagged DIY, diy project, don't hire a professional, painting, scraping, Scraping Paint. Bookmark the permalink. You dummy whyd you leave that bare wood exposed for 3 years? That’s not gonna be good. And you need to stain that house not paint it. And you better prime ALL them patches too. In fact don’t stain. You’ve screwed it all up to much. Just prime all of the house and then paint it. And next time call a pro like me. You dummy. Your house is going to look like a turd when your done messing it up. You can think it looks good but I promise you it won’t. It will look like a turd. You diy dummies are to much. Wow, Buck. While I appreciate your criticism of my work, you’ve helped to cement one of the reasons that I do most of my own work around the house. The wood was not exposed for three years. Only a moron would leave bare wood exposed that long. It took me three summers to scrape, then prep, then paint, each section, one at a time. I fully agree that true pros can do a good job much more quickly than I can. I also agree that many DIYers do more damage than good. However, one of the reasons I started doing my own work is from too many interactions with crass “professionals” like yourself. While painting is easy to mess up, you’ve got to admit that it isn’t complicated. I enjoy taking on many types of jobs specifically because I get to learn the details of doing good work. 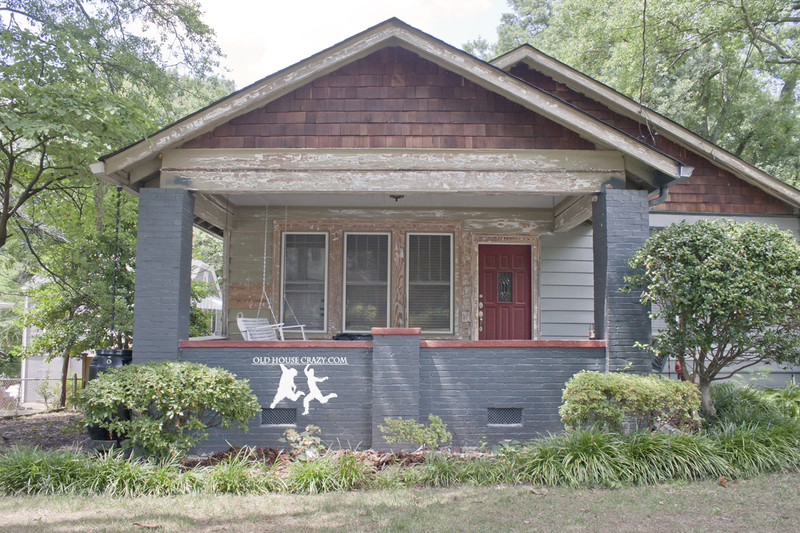 With the thought and care that I put into my paint job, I’d put my work up against any home in the neighborhood, all of which were painted by pros. Stop trolling DIY blogs and get to work. I’m not sure how much work Jenny did on Robby and Christy’s house, but the latter two have done an awesome job. If Mr. Doogan’s grammar and spelling are any indication of his work quality, I pity anyone who hires him. Yea, I had thought about that after leaving the post, but I figured the guy would still get the message even if I had Robby with the wrong gal. Personally, I hate painting but have my worker guy who don’t want to do anything other than paint which works out good for me.